Choosing the perfect paint color for your dark room is easier than you think! Some rooms are inherently darker than others. In fact, depending on the amount of light that can come in through your windows, a room may appear darker or lighter, In turn, this can create some difficulty choosing the perfect paint color for a specific room. Here is a guide you can use next time you want to upgrade the paint in a room that lacks light. The first thing you want to do is figure out exactly how much light gets to a specific room. In fact, by observing how much natural light is able to get in you can instantly understand how to approach choosing a certain hue of paint. In addition, any lack of natural light can easily cast shadows throughout your room which can deeply affect the paint’s appearance on a wall. 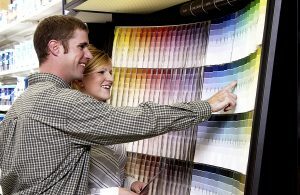 Therefore, it is typically best to be patient with choosing a paint color for the best results. This is important when you are painting rooms that have tiling or other materials on the wall. In fact, taking into consideration everything that a room has is a critical aspect in choosing the perfect paint color for a room. Furthermore, it is also important to take into consideration all the furniture and decor items that are in a room. Everything must work together and complement one another if you want your room to have a collaborative effect. Just like any room, most dark rooms have a range of hues that can be identified. In fact, understanding just how dark or light your room is will be the crucial component of picking the perfect paint color. In addition, you can always consider using light tints in a room which have the wonderful ability to alter the shadows that may appear in most dark rooms.